The team behind one of my favorite multipurpose moisturizers has brought that same thick, marula-oil-filled-goodness to a simple lip balm. 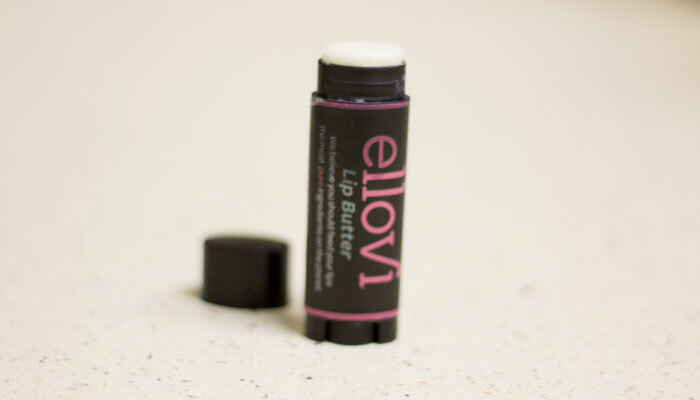 I’m talking about Ellovi and its standout Butter and new Lip Butter. Now there was nothing keeping me from applying the original Body Butter to my lips, but the gorgeous, heavyweight glass jar wasn’t exactly something that could fit in my small black cosmetics case. Ellovi took a cue from all the ladies out there trying to get past TSA with their Body Butter (but my lips get so dry on the plane, Mr. TSA Man!) and created Ellovi Lip Butter so we could easily pocket the good stuff and apply it to our kissers whenever we see fit. Like the Ellovi Body Butter, Ellovi Lip Butter is anchored by six simple, oh-so-good-for-you ingredients and smells strongly of marula and macadamia oils (which is a good thing to my nose). There’s no vanilla-fruit-flowery nonsense going on here; it’s just a pure, earthy scent that’s pleasing and easily unisex. And it’s just that simple, folks! At $10, Ellovi Lip Butter is a pricier lip balm Ellovi Lip Butter costs just $5, which makes it a no-brainer to repurchase— it’s very comforting and soothing to my winter-chapped lips, and I really like the idea of supporting a couple of cool folks in Oakland (they like animals and yoga! insta-friends). UPDATED: I mistakenly said the Lip Butter costs $10 — I accidentally added two balms to my cart to check the price, which is why I thought it cost $10! Have you tried Ellovi Butter or Lip Butter yet? What are you waiting for? Tell me about your favorite lip balms in the comments section.